Carpet Wand - 2 Jet 12"
M-Power Carpet and Upholstery Cleaner Concentrate: The next generation in Eco-friendly cleaning. The first product in the M-Power Range, which has been produced following extensive research and development by Solutions Ltd is manufactured here in the UK and meets or exceeds all currently known domestic and international regulatory standards. It is therefore one of the most Eco-friendly cleaning solutions available with today's technology. M-Power has been tested to ensure that all compounds that are considered toxic or otherwise hazardous to the operator or the environment are not present in this unique formulation. Every product in the M-Power range uses powerful natural-molecular technology combined with advanced biotechnology techniques. The result of this new technology is an amazing range of environmentally friendly and biologically active cleaning solutions, which clean without compromising performance or safety. Derived from renewable sources, M-Power Carpet and Upholstery Cleaner is safe in use, storage and disposal. This unique product dilutes at an unbelievable 1:120 for normal carpet cleaning and provides a solution for environmentally aware companies and customers who appreciate and understand the need to use non-toxic, eco-friendly solutions in the cleaning process. Manufactured from 100% natural plant based materials. Exhibits anti-bacterial & anti-viral properties thanks to its unique natural-molecular cleaning action. When used at the recommended 1:120 dilution, M-Power Carpet and Upholstery Cleaner will typically cost less than 1p (one penny!!) per square metre of carpet cleaned. Certified in line with The Woolsafe Organisations stringent standards and safe to use on wool and synthetic fibre carpets and rugs. Used this M-Power product for the first time and its cleans very well compared to many other products out in the market. I used to use products from many well known suppliers, untill i started using M-Power from solutions, since i started using M-Power i have found that i can get better results in less time than using detergents and as i dont need anything other than plain water in the solution tank of my machine i save money as well and my customers are also delighted with the results as well. Simply amazing product. Just tried M-Power and results exceeded my expectations! This is definitely one of the products every carpet cleaner must have in their van! M-Power is an excellent product, i will be ordering more. With so many eco products on the market that don't cut the mustard this is one I can't rate enough! After 4 years of constant use it rarely fails to produce the results & it offers so much more than just a carpet pre-spray. 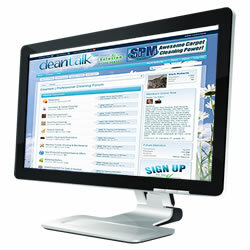 The original and still No1 cleaning forum in the UK!. Talk with other cleaners about techniques, marketing ideas to football scores..
Click here to join today, its free! Trusted by thousands of customers, if you need any help please join cleantalk for answers, or phone us on 01209 204343. We are passionate about cleaning, stocking the highest quality products. An unrivaled range of solutions & machines, providing the widest selection.